I got the inspiration for this model after buying the Revell AT-RT and looking at the main armor plate. 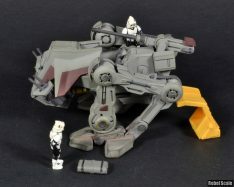 Most of the pieces are from the AT-RT model...just rearranged. I ended up buying a second model and using pieces of both. The blasters are part of the antennae that the AT-RT model sports, whereas the side armor panels come from a Dragon tank kit. Other pieces, including the seats, center body, large cannon, computer displays, and rear power unit also come from the AT-RT models. Painting consisted of a Polly Scale Neutral Grey with Model Master Anti-Fouling Red markings. I finished with basic weathering and edge highlights. I may consider adding more weathering later. Due to the ongoing success of smaller more mobile Separatist droids, the Republic commissioned KDY to build several variants of open-top bipedal walkers. 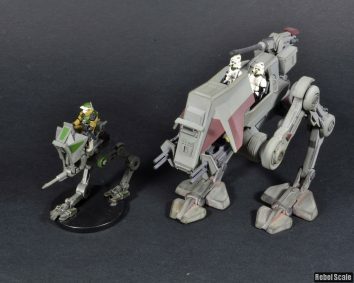 Among those built were support and suppression walkers including the AT-RT and AT-LE. While the AT-RT was smaller and easier to mass-produce, the AT-LE featured more firepower and fared better in open battlefields. Moreover, the AT-LE could engage multiple targets at once and often saw use as a spotter for larger walkers or air strikes. The AT-LE featured an open cockpit design like the earlier AT-RT. However, the AT-LE implemented much more armor and weapons. The additional armor added much needed side and rear defenses from small arms, but still allowed pilots a good view of the battlefield. Other armor slabs were placed near the cannons and engine to protect the internal systems from stray hits. The AT-LE boasted two independent tracking twin blasters in the front. 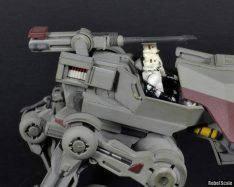 An additional rear weapon mount added the ability for the AT-LE to carry a small mass-driver launcher, similar to that of larger walkers. This cannon generally holds artillery shells, but could be refitted with flak shells for an anti-aircraft role. The primary drive train received energy from a power generator at the rear of the walker. This generator had additional aft armor, and was nearly impenetrable from small blaster fire. A forward bank of disposable energy cells provided power to the blaster cannons as well as maintaining a redundant backup cell for emergency use. These disposable energy cells proved invaluable for the walker’s compact design and would later see use in the AT-ST walker. Initially, the suspension of the AT-LE presented designers with a problem maintaining balance. It was due to this setback that engineers added so much armor, as well as shifting the weight forward. However, the balance problem reemerged when the gunner fired the mass-driver cannon to an adjacent target. 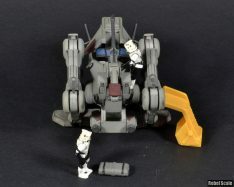 The recoil caused the walker to fall in the opposite direction. After a final revision, the designers solved the dilemma, but the mass-driver mount lost its ability to rotate. Thereafter pilots had to turn the vehicle to aim the cannon, reducing the effectiveness, but at least maintaining stability. 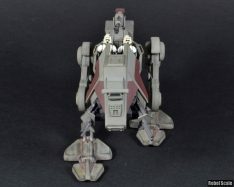 Often paired with larger walkers such as the AT-TE, the AT-LE would bombard the enemy with artillery shells. 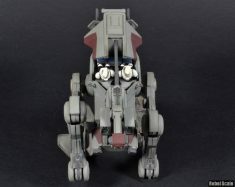 In many cases, two or three AT-LE’s would take up a defensive formation behind the main assault force, knocking out enemies from multiple angles. 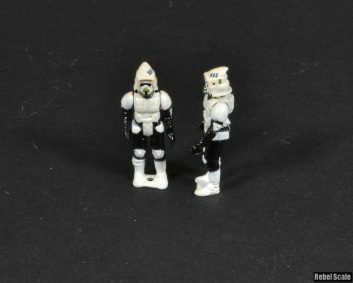 Clone reconnaissance troopers also enjoyed the use of AT-LE’s, accompanying them with AT-RT’s or other light assault transports. 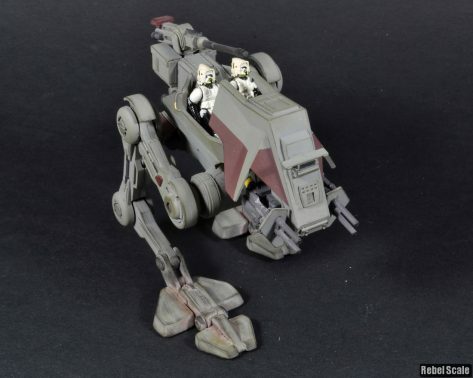 The fast speed of the AT-LE made it a good choice for gunship strike teams. AT-LE’s refitted for anti-air roles would scout the landing zones first and provide defense for the vulnerable gunships as they unloaded troops. After any primary assaults, AT-LE’s would stay behind as sentries for the new outposts.